Mealybugs are often introduced into greenhouses on infested plants. They are typically a problem in interiorscapes and retail greenhouses in Massachusetts and on long-term crops such as cut flowers, orchids, and foliage plants. Citrus mealybug lacks any waxy filaments on the body and has a gray stripe that extends the length of the body. This species may lay up to 500 eggs in irregular cottony masses. This species produces living young instead of eggs and can be identified by their long waxy filaments that protrude from the end of the abdomen. 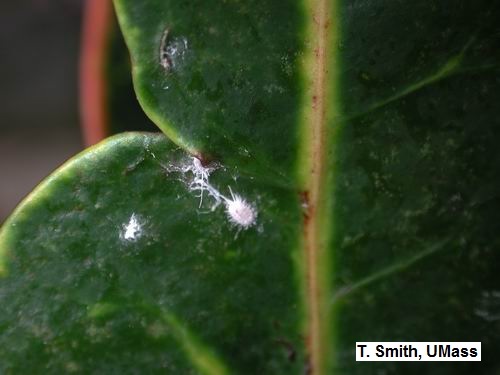 Longtailed mealybug can be a major problem on plants grown in conservatories (e.g., cycads, orchids and ferns). Obscure mealybug (Pseudococcus viburni). Obscure mealybug also has waxy filaments but they are much shorter than those of longtailed mealybug. Generally these insects are slow-moving and sac-like in shape. They appear as masses of wax and may occasionally be detected on the roots of wilting plants. These mealybugs, which are not as active as mealybugs that feed above-ground, are typically covered with a fine, powdery, wax-like material. Root mealybugs do not possess the marginal filaments that are typical of other mealybugs. Nymphs are covered by a white waxy material, and are located in the crevices of growing medium or in excavated chambers on the outer edge of the root ball. Root mealybug feeding causes stunting and leaf yellowing. Damage is usually noticeable when high populations are present. Once introduced into a greenhouse, root mealybugs may spread to other plants in water leaving drainage holes of containers, in growing medium or plant debris, or on equipment. Root mealybugs may also infest adjacent plants by crawling through drainage holes of containers. If a greenhouse is infested with root mealybugs, all infested plants and debris should be immediately discarded and replaced. Be sure to disinfest containers before reusing them. Other mealybugs that have been introduced into the U.S. and which may also be present in greenhouses, include the pink hibiscus mealybug (Maconellicoccus hirsutus), madeira mealybug (Phenacoccus madeirensis), and the Mexican mealybug (Phenacoccus gossypii). Mealybugs usually enter a greenhouse on infested plant material. Mealybugs use their piercing-sucking mouthparts to withdraw plant fluids. Both nymphs (referred to as crawlers) and adults feed on plants and cause stunting, leaf yellowing, and distortion of plant parts. While feeding, mealybugs may inject toxic saliva into plant tissue, and excrete copious amounts of honeydew that serves as an excellent growing medium for black sooty mold fungi. The presence of black sooty mold fungi inhibits the ability of plants to manufacture food via photosynthesis, and detracts from the plants' aesthetic appearance. Mealybugs feed on a wide range of plant hosts including coleus, croton, dracaena, English ivy (Hedera helix), fuchsia, gardenia, hibiscus, mandevilla, stephanotis, palms, orchids, and cacti and succulents. Mealybugs are soft-bodied, segmented, oval-shaped insects. Adult females are 1/20–1/5 inch (1.0–5.0 mm) long and are usually covered with a white, powdery, waxy material. A fringe of waxy filaments may be present on the margin of the body. Mealybugs retain their legs throughout development, allowing them to move from plant to plant within a greenhouse. Newly emerged nymphs or crawlers require 6–9 weeks to mature. Some mealybug species, like the longtailed mealybug, give birth to live offspring. Other species, like the citrus and obscure mealybugs, lay masses of up to 100 yellow-to-orange eggs in a white cottony sac. Eggs hatch in 5–10 days, but unhatched eggs or young nymphs may remain inside the cottony sac if environmental conditions such as temperature and relative humidity are not favorable. Adult males of most species of mealybugs are small winged insects that do not have functional mouthparts. Their primary role is to fertilize females. Early detection and then isolating infested plants is important to prevent mealybug outbreaks. Mealybugs are usually located on leaf undersides, petiole and leaf junctions, and near the base of plants. Mealybugs can also be found on the inside of container lips and in the drainage holes of containers. On standard plants, they may hide under the tape on the garden stakes. Honeydew, sooty mold and the presence of ants may also be signs of a mealybug infestation. Mealybugs can live for 2 to 3 weeks without hosts. Power washing the greenhouse between crops is helpful to remove mealybugs hiding in cracks and crevices. Young, immature mealybugs prefer to move to tip growth to feed, so inspect stock plants before taking cuttings. Susceptible plants, should be monitored closely and include coleus, rosemary, sage, Swedish ivy, artemesia, Ipomoea, palms and gardenia. It is difficult to manage mealybugs with pesticides due to their waxy coating. Mealybugs are best treated when detected early, when populations are low. It may be best to discard plants if only a few plants are heavily infested. This will help to minimize their movement onto other plants. The young nymphs or crawlers, do not have a waxy covering so they are susceptible to spray applications of many insecticides. Systemic insecticides must be applied preventively while plants are actively growing so that lethal concentrations of the active ingredient are present at feeding sites. Since systemic insecticides do not kill eggs, additional applications may be warranted after 3–4 weeks. Contact insecticides such as insect growth regulators, insecticidal soap, and horticultural oil effectively kill young nymphs; however, as eggs hatch throughout the growing season, repeat applications are required. Application frequency depends on the residual activity of insecticides used, varying from 1–3 weeks. Thorough coverage of all plant parts is essential. The use of a spreader-sticker may improve coverage and penetration, but may also increase the risk of phytotoxicity. Insecticidal soaps and horticultural oils effectively kill eggs, nymphs, and young adults. Systemic insecticides applied as a drench to the growing medium may effectively control or regulate root mealybug populations. Parasitoids may suppress or regulate mealybug populatiions in conservatories and in greenhouses where plants are maintained for extended periods of time. Identify mealybugs to species before releasing any natural enemies. For example, the commercially available parasitoid, Leptomastix dactylopii, only attacks the citrus mealybug and is very effective in controlling or regulating citrus mealybug populations on long-term crops. It is not useful against the longtailed or obscure mealybug. In general, predators are less efficacious against mealybugs than parasitoids. The predatory ladybird beetle, known as the mealybug destroyer, Cryptolaemus montrouzieri, may be used to manage citrus mealybug populations. Both the adults and larvae are predaceous. The mealybug destroyer is less effective in managing longtailed mealybug because adult beetle females lay their eggs among the egg sac of citrus mealybug; longtailed mealybug females do not lay eggs since they give birth to live offspring. The mealybug destroyer is most effective from spring through fall, being less effective in winter. The pest control materials containing dinotefuran and acetamiprid have been shown to be directly harmful to the mealybug destroyer and L. dactylopii whereas pyriproxyfen and flonicamid are compatible with both natural enemies.